It is not quite Halloween yet, but the festivities in Maputo started last night. Okay, so there won't be a lot of festivities. Halloween is basically an American holiday. No one around here really gets into it...including my husband as you can tell from the photo. But I LOVE Halloween. Ever since I was little my mom would always dress us up in these fabulous costumes...so I guess that tradition has stayed with me. Well, this year I didn't have any costume shops to go to so I had to get creative. I hope you can figure out from the photo above that I went as Carrie. Luckily the US Marines hosted a party last night and my fellow Americans were into the Halloween spirit. Click here to see some of the costumes from the party. You will notice from the photos that JJ was feeling a little left out and as the night progressed he started taking pieces of other people's costume and morphed into the "Flying Dutchman." Happy Halloween! I am a member of the Kupfula Photography Club and we have our very first exhibition in two weeks. This is all very exciting for me since it is the very first time my hobby has been displayed for everyone to see. I hope people like the photos and we raise money for the local orphanage that we have selected as our charity. For all of us in the group....i think....it is our first exhibition. Wish us luck. 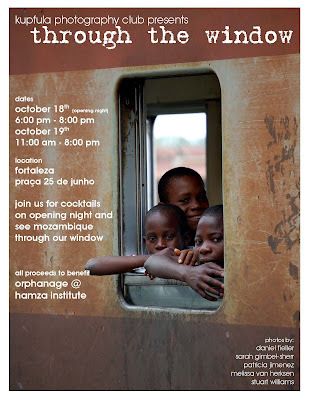 I hope you can make it if you are in Maputo. 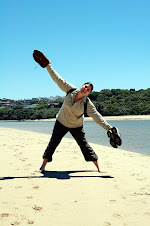 My the way...kupfula means "aperture" in the local dialect here in Maputo.